Reduces bleaching and chemical damage to hair and skin. Imagine the feeling of showering under a waterfall in a tropical paradise. Well now you can experience it in your own home. 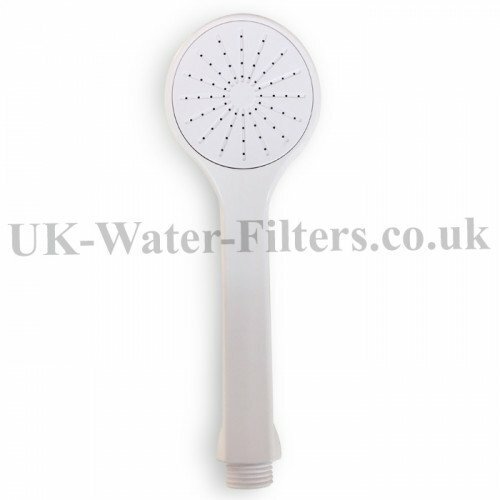 This new to the market, British made shower filter is the "best in class" for filtering your shower water. Regular exposure to chlorine in a shower can cause brittle hair, dandruff, dry skin, and red irritated eyes. Medical studies suggest that chlorine aggravates existing eczema or asthma. Since 50% of our daily chlorine exposure comes from showering, it is important to shower in clean, chlorine free, filtered water. This cool Shower Filter fits easily to the base of the great majority of shower units and to the top of shower taps. 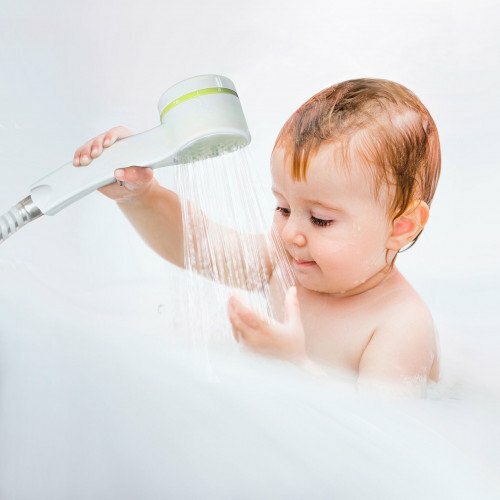 Provides a natural and healthy shower for you and your family. And it doesn't just clean your shower water - it also oxygenates it. One of the few times that I have bought a product and it actually works. So much so that I would say that for me as a psoriasis sufferer it’s a life changing event. After every shower my skin literally dried out and cracked up no matter what creams or bath salts I used. Now I look forward to my shower and have no anxiety about getting out of the shower as the soft water leaves my skin soft and comfortable. Thank you for your product it’s a lifesaver." The specially designed holes in the shower head produce a vortex within the water. This improves flow and allows oxygen to enter the water stream. Now you can have a more invigorating shower that uses less water! This oxygenating technique is used by the world's top hotels and spas. Now you can enjoy what their guests get. Don't just feel clean. Feel great! Get softer skin and hair. Plus... descaling action; greatly reduces unsightly scale marks. Your shower cabinet glass and tiles will look pristine. What is the inside the shower filter? Enhances pH balance for the healthiest most refreshing shower ever. These Active Ceramics display physical properties of semiconductivity, magnetic properties and light emission (in the far infrared spectrum). 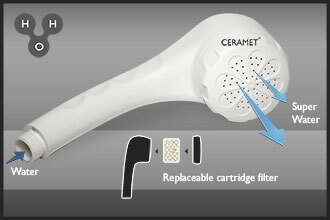 As water passes through the shower head the action on the ceramic beads inside creates an electrolytic effect. This removes up to 99% of chlorine, bacteria, organic contaminants, VOCs (potentially toxic "volatile organic compounds"), heavy metals, and other harmful impurities. Yes, it will fit any standard UK shower hose / head. You simply unscrew the shower hose or head. It is very easy. No plumber or handyman is required. Will It Affect My Water Pressure? 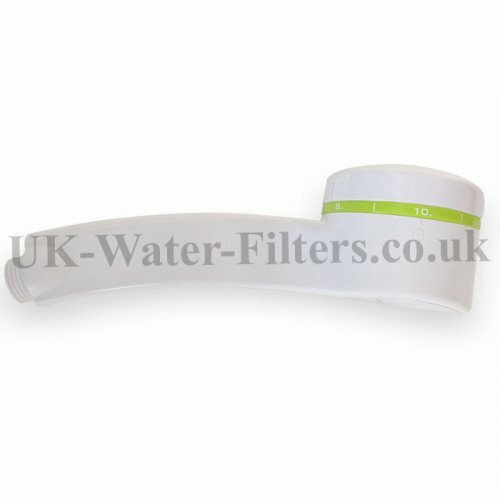 The filtration media inside the filter cartridge is "loose" so it doesn't give as much resistance as a "barrier" filter where the water has to be forced through. NOTE: Not suitable for some old style electric showers where pressure is already very low. Read more in the "Technical" section - see below*. 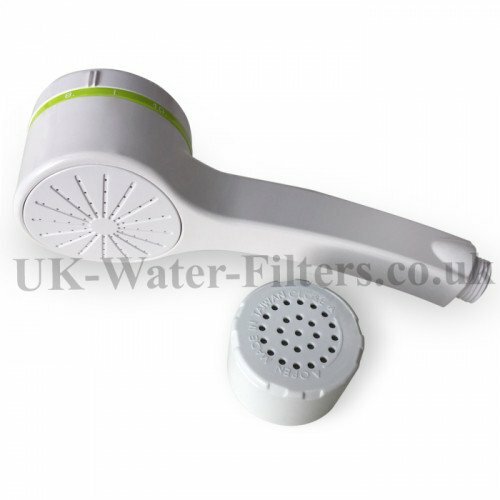 Click here to read about your shower filter replacements and to buy replacement shower filters now. Cost of replacement cartridges £19.97 incl. free delivery and VAT. You simply unscrew your existing shower hose or head and screw on your new shower filter. It is very easy. It will literally take 2 minutes. You can expect some pressure loss but only around 5% max - almost unnoticeable. water has to be forced through. *NOTE: Not suitable for some electric showers where pressure is already very low. Your shower pressure must already be reasonable in order for the filter to work properly. (Please note It works fine for some electric showers. What we mean is if the flow is already almost a dribble then the water will not pass through the ceramic beads fast enough for them to perform properly). VERY happy with this item - my hair feels much softer. Customer Services. Good customer service - very helpful and efficient. I very happy with UK Water Filter Ltd and will be using them again. Their communication is excellent having had queries regarding my order, which I received quickly. I ordered the shower head as a possible solution to the hard water I have to put up with. I invested my time to carefully research quality filters having had useless versions from other companies, which quite frankly are all of the same mould. This shower head/ filter works. It absolutely lessens the effects of hard water on the skin; its build quality is way beyond what I have had in the past and unlike most shower head filters, it does not slow the flow of water. the shower filter has really calmed down my sensitive skin and made my hair all smooth and shiny. the people who work there are extra super helpful and friendly. 10/10 the best. the water filters on and working well. Its a pretty good shower head spray as well, and theres no discernible drop in pressure. My hair has been much softer since installing this shower head (which was very easy and I really liked the recyclable packaging too). It's finally repairing after a few months of abuse in very hard and scaly water! I love my shower head water filter. I discovered the company 6 months ago when my family and I had a host of scalp and skin issues. Since using the filters there has been a great improvement in our scalp and skin. I have been able to stop the steroids I was prescribed for eczema. I love my new skin thanks to to my filtered water. I notice the difference to my skin when I am away on holiday for a few weeks and not able to use my water filter. Love the filter - Review by Amazing! This has made all the difference. My shower water feels soft and it's made a huge difference to my hair which is very fine and I think London water was drying it out and making it frizzy. Hair now shines and feels lovely as does the rest of me!! So glad I bought it. The product I'm using is great. And the support is even better. The filter was an unusual but requested birthday present for daughter. It was easy to fit and she is delighted with it. Thank you. I bought your water filter originally from Healthy House. They have not been selling them recently and did not give me information about your firm. It was by pure accident that I saw them on your website. Why was I so diligently looking for this particular one, when there were others available, and I had tried two others sold by Healthy House ? The shower head is superbly balanced, others are awkward to unhook from the shower head holder. The filter is located in the head, not as a bulky 'screw on' between the hose and original shower head. Others are clumsy and one cannot direct the spray to wherever one requires the water. Fortunately I had saved my first shower head and the extra replacement fits perfectly, easy to pack in my hand luggage consequent I now have one to bring on holiday. Overjoyed at my discovery and purchase. It was fitted Seconds after it was delivered by the postman. Somerset is a county where they like messing around in a boat or arriving with a caravan . Most have a shower, toilet and basin rooms. These showers are perfect for such a situation because the water flow in your particular shower is superior to others. I have used UK Water Filters for many years to purchase water filters for an American style fridge with a chilled water tap. They have always been very fast and efficient with the service and the product is superb. I have recently purchased a shower head with built-in water filter to help with the hard water problem here. Again the service was fast and efficient and the product is great. First class service as usual at a very competitive price. The water filter you sent is simply lollipops, I have no complaints or concerns, it was fitted in seconds and the water pressure improved! The shower head is very good quality - I think it is probably too early (only a couple of days) for me to notice a major difference in my skin quality but I think I notice a difference in that my hair is not so coarse. Overall very happy and good service from this company. Usually I don't write reviews for the products I've purchesed but this water filter it's so amazing and so worth it that I had to leave a review. I've decided to order a water filter as my skin got worse since I've moved to London. I've noticed a major difference on my skin and my hair from the first use of the filter. My skin is not itchy anymore . It used to be so itchy and so dry from water, I also have eczema , but now my skin its softer and my hair looks so good. Goodbye fizziness!! Just nice and silky hair. Another big plus for this water filter its that the water pressure its way much bigger that it used to be! the water pressure increased a lot with this filter. It arrived quick and well packed and good quality! Well worth the money! I wish I found out earlier about it! TOTTALLY RECOMENDED! You will have no regrets buying it! I absolutely love the water filter. I have exzema and dry skin and was suffering from dryness from my shower nearly everyday. Now i have the water filter my skin is so soft and mousterized. Im so happy and will continue to buy more or even upgrade to buying a full home one in the future. You can really feel the water texture is softer than before. There is distinct improvement with this filter in place and NO chlorine smell atall...less itching and less frizzy hair. All good. Reserving judgement in respect of the longevity of the filter but definitely better than unfiltered for sure. 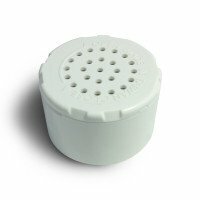 I'm on my third filter now - this time I bought the replacement cartridge for the shower water filter instead of the whole unit. I notice the difference in how my hair and skin feel after hard water is filtered compared with putting up with hard water unfiltered - really unpleasant - dry itchy skin and hair that feels like rope! So I wouldn't be without the shower water filter now and have recommended it to many other people. My shower head is excellent, hair is left soft and it fitted my portable shower that fits over my hot and cold bath taps. I am really pleased with it. We love our filters. The shower filter went on immediately!! I will never go without water filters again! Thanks for the excellent service and the wonderful and imperative filters. Do what I did - tell your hairdresser about the shower filter so that they can install one in their salon hair-wash basin! I told my hairdresser how much nicer my hair is being to me now. She was surprised that it was inexpensive and is now planning on getting one for herself, one for the salon and telling all of her clients! Everyone deserves good skin and hair..spread the word! Arrived the very next day. that was quick ! I installed it straight away and it's working really well. Shower feels great !! Hi I bought this water filter for my daughter as she has moved to London and the water is really hard. I received a text from her saying ( I no you bought me a car but the shower head is the best present you've ever bought me in my life ) so thank you very much she is delighted with it. My hair has been shocking since I moved to East London. I mooched about on the internet and this seemed like a reasonable option...After less than a week my hair is soft and shiny again. If you have rubbish water, buy one of these, its worth it. The water filter has arrived and is working perfectly thank you. It took me a while to fit as I was unable to get the existing shower head off, but as of 1st July I am sing the new one. Water here is very hard and I now find that I am able to shower without wanting to scratch my skin to pieces afterwards. Wish I had known about this 8 years ago when I moved to London. I always wondered why hair always looked SO much better (and unreplicable) after a salon visit. It is because they have water filters for their sinks! Once discovered this I did an immediate search for a home product and found UK Water Filters and their shower head. Soft hair full of body now. I am really very impressed with palpable the change of quality in the shower water now, which is something I hadn't expected to notice to be honest. It definitely feels more velvety and less harsh than the water from the tap next to it. My hair has never felt so good, just a shame I didn't do it years ago when I had more hair to be bothered about! I can't imagine why I never knew about these kinds of products before now. After receiving my Shower Water Filter and noticed a difference straight after using it. I live in a very hard water area and was getting desperate about the state of my hair and how dry my skin was after a shower. I now fill the bath from the shower head, as well as using it in the regular way for showering and washing my hair and my skin's already feeling the benefits, as is my hair and that's just after a week. It's really easy to order and fits the usual shower hose perfectly. Don't delay in ordering!! 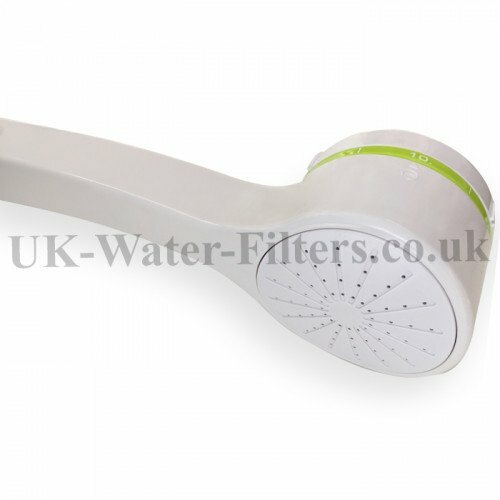 Thanks so much, we love the filter and we'd like to leave a review because we don't know if this is pure coincidence but since the day we fitted the shower head our cat is drinking the water from it instead of Her usual bowl! Pretty amazing. Also both filters so far so great..! Thank you for your telephone call this week answering my query about this item size. I have now received the water filter shower head and it fits perfectly. Thank you so much. It does everything as described in your advertisement. I washed my hair this morning and it feels lovely and silky smooth - no frizz. Also I am very prone to skin irritations and I have had no skin reaction after using your filter shower head. I am absolutely delighted. This was the best filter shower head ever! Filter arrived fine. I love it. Was very easy to fit and it makes a huge difference when I shower. Perhaps it's psychological - I don't know - but my hair and skin feels softer and smoother. Sounds like a bad tv advert doesn't it, but it's true.